A light & music revolution, a growing collaboration. With the longest ever running single on the Billboard Hot 100, Imagine Dragons contacted Moment Factory for an album-cycle long collaboration that would take their performances to another level. Our creative team immediately bounced back and forth with the band on concepts of illusions, shifting perspectives, aesthetic polish, and transformation. 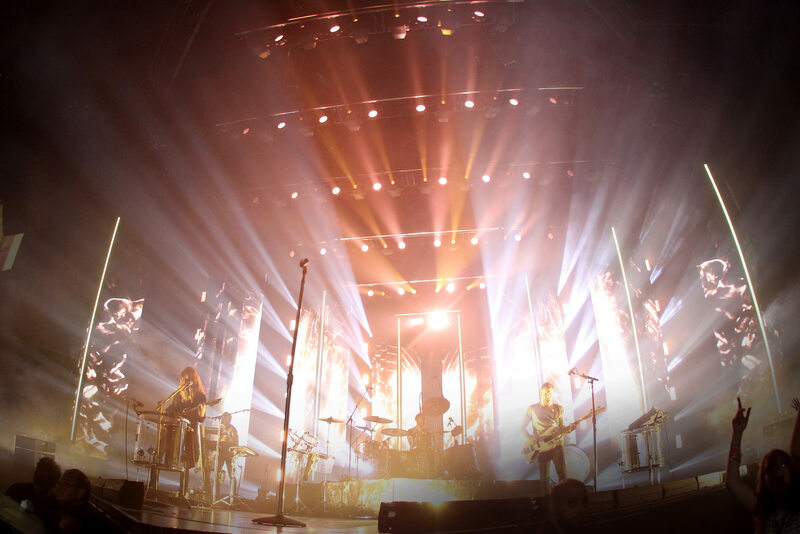 Whether it be a design for the Smoke + Mirrors Tour or a music video (such as Gold), the band wanted a constant conceptual and aesthetic thread throughout their performances. Each of the 7 collaborative experiences designed by Moment Factory maintain the same visual voice, while utilizing numerous technologies, effects, and tools. 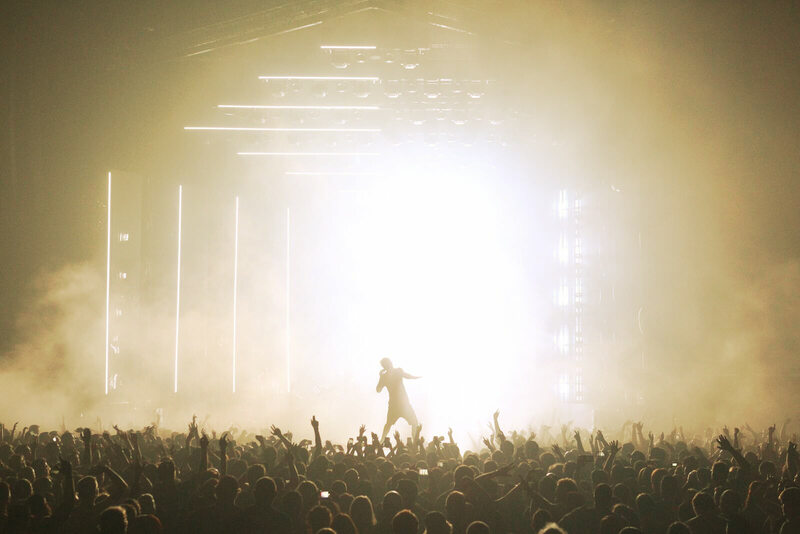 Our team pulled out all the stops using everything from real-time 3D cameras, magnifying lens walls, automated mirrored walls, audience scanning lasers and projection on clouds of smoke. Having the expertise of set design, content design, lighting, interactivity and systems design under one roof enabled the creative vision to be clear and continuous throughout the cycle. Experience has demonstrated that a strong show is achieved by conducting the visual orchestra; knowing when to pull elements down and when to raise others. The scale of each experience varied immensely. An album listening launch was a much different approach than a music video, or even a permanent video experience stretching 4 city-streets long. Our team was able to develop a journey that takes the viewer through distinct worlds with each one. 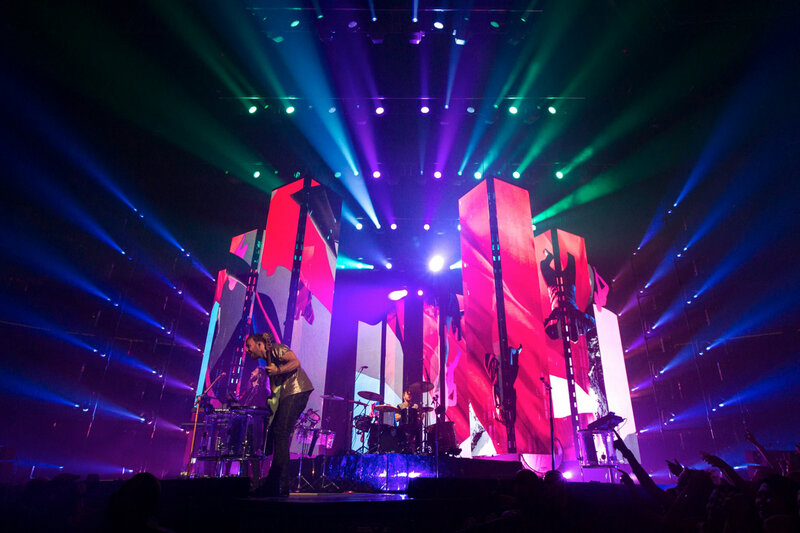 Whereas the Fremont Street Experience travelled through a dystopian Downtown Vegas and into an ethereal celestial universe, the Smoke + Mirrors Tour slowly introduced colour, dimension and optical illusions over the 90-minute show. 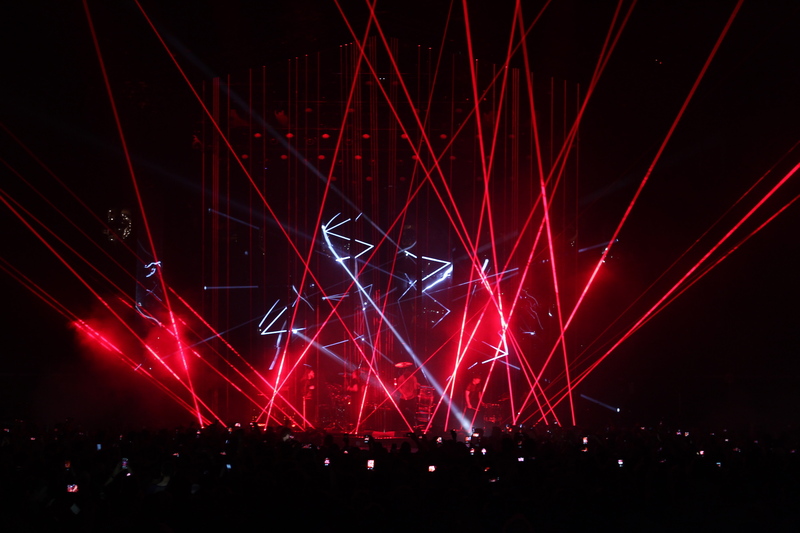 The latter culminated in a bright, fantastic world of moving stage elements and surreal environments before transitioning into a final act of pure reflected laser lights. At the closing of each night on tour, the audience was showered in confetti discreetly containing 12 tickets to receive autographed merch—creating an extraordinary hidden treasure hunt for diehard fans.